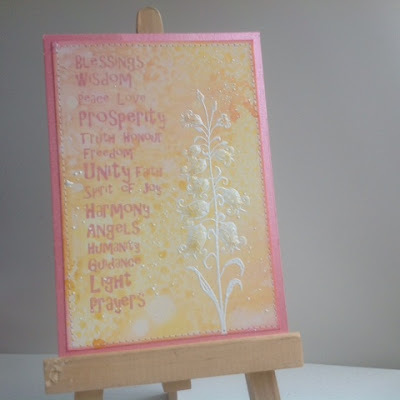 Posting for the Craft Barn challenge (Good Luck) and the Lavinia challenge (glitter and gems) with this little card. I just love the words on this stamp, all those things one is really wishing when saying a simple "Good luck!". The background is Tattered Angels mists, and I heat embossed the lily. 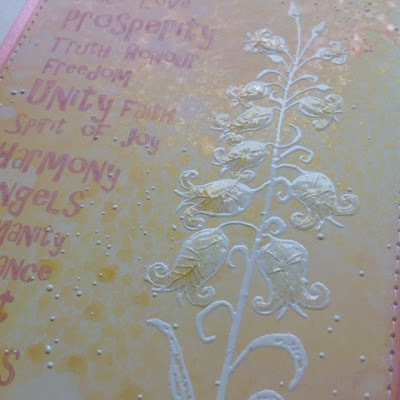 Glitter is in the shimmer of the background and the Wink of Stella that I used on the flowers. The flower heads themselves were turned into small gems by filling them with Crackle Accents. Thanks for stopping by! This is beautiful, love the wording! Perfect! Thank you for joining in The Craft Barn Challenge. Love this.....and love how you've used the crackle accents on the flower heads. Thanks for sharing with us at Lavinia Stamps.